Semtech Corporation (Nasdaq:SMTC), a leading supplier of analog and mixed-signal semiconductors, today announced that it, along with Keysight Technologies, will discuss LoRa® Wireless RF Technology and low power, wide area networks (LPWANs) for the Internet of Things (IoT), in a live webcast on Friday, Jan. 27, at 10:00 a.m. PST. 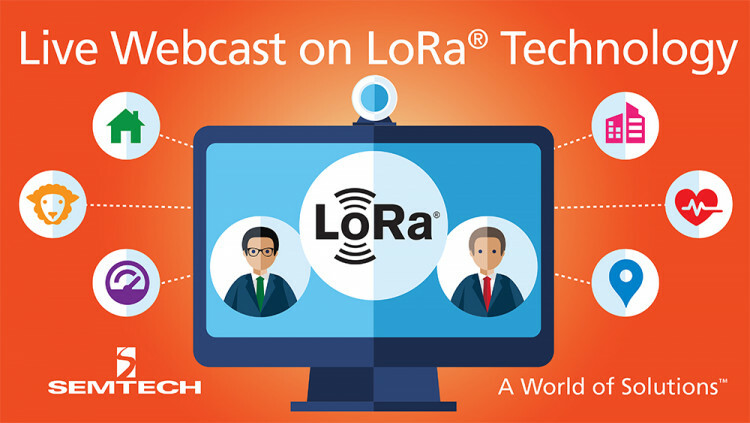 The webcast, titled “IoT: LoRa Technology Introduction and Solution Testing,” is geared toward engineers interested in learning how LoRa Technology specifically caters to LPWANs and IoT applications and about various test methods for LoRa-enabled devices. Registration is available on Electronic Design’s website. Semtech will discuss the benefits of LoRa Technology including its unprecedented range, low battery power requirements, GPS-free geolocation capability, and high sensor capacity. LoRa-based IoT networks and products are deployed in over 50 countries worldwide, giving enterprises, government agencies and consumers access to smart, data-driven solutions for manual business processes, day-to-day consumer and enterprise inefficiencies, environmental conservation, and public safety. Keysight Technologies will demonstrate various test methods for LoRa-based transceivers to give attendees a comprehensive overview of the resources available to implement LoRa Technology for IoT applications. Mr. Mohan has extensive experience working in various product marketing and applications engineering management positions responsible for wireless products. He, along with Ian Reading, Industry Segment Planner for Keysight Technologies, will present during the webcast. The webcast is hosted by Electronic Design and Microwaves&RF. Registration and additional information is available at www.electronicdesign.com/rf-design-and-test-webcast-series?code=Semtech. Engage with the NEW LoRa Community or contact Semtech’s support team for technical support or general product inquiries. All statements contained herein that are not statements of historical fact, including statements that use the words “will,” “geared toward,” “designed to,” or other similar words or expressions, that describe Semtech Corporation’s or its management’s future plans, objectives or goals are “forward-looking statements” and are made pursuant to the Safe-Harbor provisions of the Private Securities Litigation Reform Act of 1995, as amended. Such forward-looking statements involve known and unknown risks, uncertainties and other factors that could cause the actual results of Semtech Corporation to be materially different from the historical results and/or from any future results or outcomes expressed or implied by such forward-looking statements. Such factors are further addressed in Semtech Corporation’s annual and quarterly reports, and in other documents or reports, filed with the Securities and Exchange Commission (www.sec.gov) including, without limitation, information under the captions “Management's Discussion and Analysis of Financial Condition and Results of Operations” and “Risk Factors.” Semtech Corporation assumes no obligation to update any forward-looking statements in order to reflect events or circumstances that may arise after the date of this release, except as required by law. Semtech, the Semtech logo, LoRa and LoRaWAN are registered trademarks or service marks, or trademarks or service marks, of Semtech Corporation and/or its affiliates. Third-party trademarks or service marks mentioned herein are the property of their respective owners.